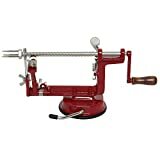 The invention of an apple peeler has tremendously reduced the time-taking, tiresome and hectic task of peeling the apples and has made the kitchen life easy. 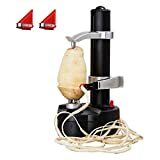 This may come as a surprise to you that there are still some people who peel the apples mechanically and if you are counted one amongst them, it’s high time to switch over to an apple peeler. 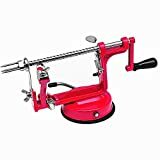 Using an apple peeler takes the cooking to the next level because of the easiness and speediness it brings along. Apart from personal usage, apple peelers are widely used by the professionals in peeling and carving out designs on the apples. 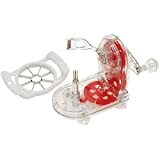 An apple peeler functions in such a way that it removes the outer core of the apples and helps in slicing the apples to the desired thickness. 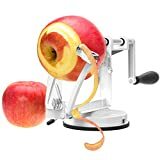 Most of the apple peelers are very simple to use and have an astounding speed. There are basically two types of designs: the lathe and the turntable; out of which the lathe type is more popular and most of the modern day designs are based on it. 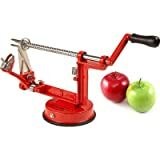 The apple peelers usually come with adjustable and removable blades which have a depth stop mechanism to prevent them from cutting in too deep. Handheld or countertop: Depending on the degree of usage, you can choose between handheld type and countertop type. If the counter space top and storage is limited, the handheld is a better choice while if you want to professionally use the peeler on a large scale, countertop will be the best. Clamp or suction base: Clamp type needs a proper smooth surface to be fixed while suction type can be fixed on any surface. Clamp type provides more stable and steady grip than suction type. Construction material: The materials to choose from are plastic, aluminum, cast iron and magnesium alloy. While plastic and aluminum peelers are lightweight with stress-free cleaning, they are prone to breaking. Cast iron is durable but heavy and prone to rusting. Versatility: Check out the review if the peeler is multipurpose and can be used for coring and slicing a variety of vegetables and fruits. Guarantee: Some peelers come with a guarantee period varying between 1 – 5 years. 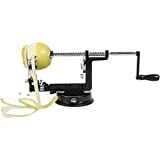 Product description: Huijia apple peeler is perfect to process the apples on a professional level as it can peel, core and slice in a very short duration. It is quite versatile in its functions and can be used for a variety of fruits and vegetables. The robust enamel coating on the Cast Iron gives it a strong base. To top up, it has modifiable stainless steel blades which sharply remove the peels. It doesn’t stumble on the usage as the sturdy suction cup base fits firmly on the base. Product Description: Armed with high-quality stainless steel blade, it conserves the nutrition by peeling just the skin. Easy functioning, sturdy ABS plastic Non-slip base, automatic peeling, movable needles for height adjustments and thickness-controlling Robotised arm are some of the prominent features. Robust power, high working proficiency, and multipurpose uses are other added advantages. Comes with extra components like 6V Adapter, 3* Replaceable Blades and 1* Handy Thumb Knife. Product Description: It peels the apples smoothly without any residues. Spring encumbered arm can customise to different shapes and apple varieties. Complemented with corer slicer and suction grip for additional steadiness. Product Description: Greater stability and strength due to Heavy Weight Cast Iron Metal and enhanced safety through safety cap. Additional features are Chrome Plated Winding Rod, 3 prong extension, stainless steel blades, Chrome plated parts and wooden handle. Very suitable for various functions like slicing, peeling, and coring. Extraordinary constancy due to potent Rubber Vacuum base. One year guarantee makes it a value-added purchase. Product Description: Absolutely easy to work with, it’s a durable product from Luxury Black Edition. Strong, stainless body gives it endurance and makes it easy to maintain. The flexible and adjustable blades peel without compromising with the nutrients. Perfect coring and slicing are added benefits. Product Description: The product comes with an easy rotating handle and sharp stainless steel slicer blades for swift peeling, spiraling and coring and hence, is very useful for professional works of big batches. Heavy-duty cast iron machine has been proved very efficient and easily operated with an additional feature of vacuum suction countertop base. Amazing cool spiral shapes are very attractive to kids as snacks. It has a measurement of 13 X 4 X 5.5 inches. Product Description: Very simple, safe and time-saving machine with highly precise stainless steel blades. Remarkably simple, safe and has low maintenance cost. Extremely versatile with dimensions of 7.5” H x 12.5” L. Heavy duty professional grade with recommended hand wash. 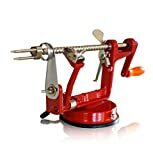 Product Description: Equipped with robust and substantial enamel-coated Cast Iron framework, this peeler provides enhanced presentation and resilience. Gives a well-founded clasp even on smooth surfaces. Excellent performance because of sharp cutting edges of stainless steel blades. Can operate 3-way by peeling, coring and slicing at the same time. The best part is it comes with a warranty period of 5 years. Product Description: A multi-purpose system of blades which can adjust to all mixer models. Made with the finest quality metal, it’s very convenient to use and store. It attaches easily to the power hub. It is highly durable and gives a heavy-duty performance. Product Description: Highly stable and strong, excellent quality stainless steel blades, rustproof chrome plated winding rod, poly handle and 3 prong extension with safety caps. Easy usage due to strong rubber vacuum base, versatile functions with all the fruits and vegetables, easy cleaning and storage. 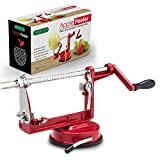 Apple peeler not just helps in saving the precious time of the customers but also avoids accidents in the kitchen like cuts and other injuries. Promotes family bonding as children and old people can participate in the kitchen activities as well. The smooth peeling with razor sharp blades makes the work very easy and increases the economic value of apples by removing just the skin.